Our list of helmet program resources has sources of helmet program info and materials, with an indication of what they can do for you. Free pamphlets, posters, videos, bookmarks. Videos for helmet campaigns. Three of them are free! Public Service Announcements on helmet safety. A quiz for 5th graders on helmet safety to teach them to use the Web. The page of Quick Answers where the kids research the quiz answers. A wrod gmae taht is a cahllnege to raed. A simple page on helmets. A coloring page for pre-schoolers. A bicycle helmet safety song. An 11x17 coloring book in .pdf format from RAGBRAI. A maze and a connect-the-numbers. A scrambled word puzzle on bike parts. A page on the brain from the Texas Bicycle Coalition. A mold for making gelatin brains. Demonstrations with melons, eggs and gelatin brains. A sample flyer for a school poster contest. What Makes an Ideal Helmet. How to Fit a Helmet. What a helmet does in a crash. The South Dakota Rodeo Guide. Our pamphlet: A Buyer's Guide to Bicycle Helmets. Our pamphlet: A Bicycle Helmet for My Child. 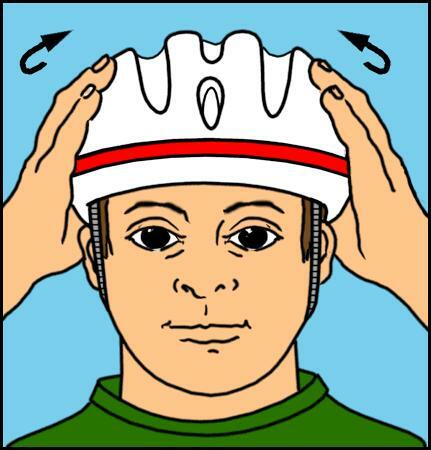 Our pamphlet: How to Fit a Bicycle Helmet. Our Helmet Fit Checklist to make sure your fitting worked. A graphic page on helmet fitting from I'm Safe. A page on helmet sizing and fitting from the Texas Bicycle Coalition. How to fix a flat tire from the Texas Bicycle Coalition. Pamphlet: How children see traffic situations. How to get our pamphlets on paper. How to get the US Consumer Product Safety Commission's free pamphlets. Basic campaign advice: an overview of what a program can be. A manual for helmet promotion programs originally written by John Williams and the folks at Adventure Cycling, kept up to date here at BHSI. How to get DOT's free pamphlets on paper, including a big report on lessons learned about bicycle helmet laws. A catalog of older DOT pamphlets and materials. A US DOT teacher guide: Demonstrating Bicycle Helmet Effectiveness. DOT's bike safety pamphlet for adults. Sprocketman comic book a free download from CPSC. Our bookmarks with a "Be Sure it Fits" theme. A review of medical journal articles on bike helmets. Some more expensive pamphlets and comic books. An illustration of correct helmet fit from CPSC. Our advice on How to train helmet fitters. A page on avoiding head lice while swapping helmets. Outline for a Talk on Bicycle Safety. Comic book: Captain Super Safe. A 16 page comic in .pdf format with a story of lost helmets solved by Captain Super Safe. If printed out in black and white it would make a good coloring book. Melon drop demo: Django's Science Experiment site. Traffic signs for setting up playground courses. Persuading your kids to wear helmets. Kids and Bike Safety: Tips on riding and sidewalk use. Promoting helmets in poor neighborhoods. When are kids ready to ride? Some medical journal articles on helmets and bike safety. A warning: no helmets on playground equipment or climbing trees!. Tips for bike safety on college campuses. A moving head injury story by a wife in Boulder. Heartfelt helmet campaign materials from a grieving parent. A novel for middle schoolers: Mick Harte was Here. Frequently-Asked Questions About Bicycle Helmets. DOT's fact sheet on Mandatory Helmet Laws. DOT's long study of Mandatory Helmet Laws. Helmets for the current season. A campaign attacking all the problems with bike safety. A long study on The Effectiveness of Bicycle Helmets. A background paper on helmet safety from Prudential HealthCare. CPSC's video clip on helmet testing and fit. A Summary of Helmet Standards. How to Repair a Helmet. How to run a program to fit and repair helmets. Will kids use helmets you give them?. A program that makes sure kids wear their free helmets. How to evaluate a helmet program. How to measure helmet use. Tips on Summer Bike Safety.
. Be sure to give us a postal mailing address if you want the Toolkit! We can usually get it in the mail to you within 24 hours, but if you need it sooner there are links to all of the materials here on this page. Here is more on requesting our materials, and here is a page with the contents of the Toolkit and a link to the pdf file if you can't wait for snail mail. Here is our Links Page for helmet program sites beyond those mentioned below. The US Department of Transportation has a Bicycle Safer Journey site: with videos, curricula, lesson plans, quizzes, and just about everything you need for classroom instruction of basic bicycle safety, including helmets. Spanish materials included. Links to other sites for more curricula. Not a helmet-specific site, but by far the best thing DOT has ever produced. We can send you their videos on disk if downloading from YouTube doesn't work for you. Helmet and safety infographic. This legal site has a series of well-designed infographics that may be useful for your program. The graphic artist is Gene Maryushenko if you have questions or comments. Monroe County NY has an annual Wheel Sport Safety Awareness Contest. They provide a description and all the forms and documents they use, from a kindergarten coloring page to the form for a sixth grade essay, rap song or poem. Brain Injury: A Manual for Educators from the Colorado Department of Education helps teachers deal with brain injured students. "Teachers have to consider the possibility that a child's learning problems could stem from a brain injury. The student with a brain injury may have problems in school that look the same as children with other disabilities." Mackinac Island Community Helmet project. A unique approach to community helmet promotion. How Not to Get Hit by Cars is a useful way to approach bicycle safety, emphasizing that "wearing a helmet will do absolutely nothing to prevent you from getting hit by a car." Healthcom Interactive has a free teacher's resource guide in .pdf format with activities including an egg drop, a scanning lesson, stop and search left/right/left, hand signals and a rap-style helmet song for grades 2 and 3. A link to the American Plastics Council's free poster..
Rad Rider is the best graphics-based helmet site on the Web. It has a 20-page comic book with super hero, chase scenes, violence, and stuff that scrolls, spins, morphs and moves all over the screen -- all putting across a safety and helmet theme. Plus a quiz you take on line and get feedback on correct answers. The Brain Injury Association of Minnesota Web site has a Public Service Announcement you can download in .mpg format. OHSU's goal is to improve the health of all Oregonians. OHSU educates health professionals and biomedical researchers in a variety of fields, undertakes patient care, performs community service and performs biomedical research, and they have a helmet section. You can download a helmet brochure from them in .pdf format. We have some other helmet promotion sites on our Links Page that you may find useful. For a much broader range of bicycle safety information than the helmet material we have here, don't miss bicyclinginfo.org for a full range of bike info including education resources and teaching materials, and The BikePlan Source with a wealth of resources for bicycle planners.